Is It Time to Suspend Islamic Immigration? 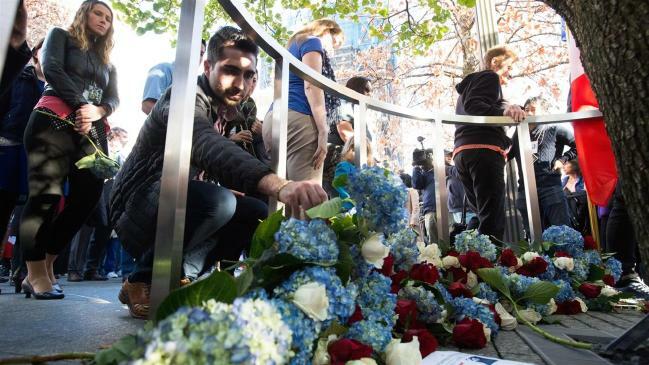 Hundreds gathered at the National September 11 Memorial & Museum in New York City for a solemn ceremony to honor victims of the Paris attacks and show support for the people of Paris. (AFA)—The carnage created by Muslim jihadists in Paris over the weekend must inevitably raise the question of continuing to allow Islamic immigration to the United States. Of particular concern is that we have now discovered that at least two of the perpetrators of the Muslim massacre in France were masquerading as poor helpless Syrian immigrants, of the very kind President Obama is importing into the U.S. in droves. In fact, the president is accelerating the process by setting up foreign offices to expedite their transfer to our shores. Hillary Clinton, who wants to be our next president, also wants to import 65,000 more of them. The unfortunate reality is that, as things are configured right now, the refugee program in particular and Islamic immigration in general represent grave threats to the security of the United States and the safety of its citizens. Our own FBI has made it repeatedly clear that we have absolutely no way to vet Muslim refugees from Syria. We have no access to Syrian records at all. No arrest records, no prison records, no record of scrapes with the law. Nothing. We have no way to identify those Muslim refugees that might represent a clear and present danger to us. Until all Muslim immigrants, not just refugees, can be properly screened, the process should be suspended entirely. The risk of importing committed jihadis, like the ones who helped light up Paris, is simply too great. While it is certainly true that the vast majority of Muslims are not terrorists, it is likewise certainly true that the vast majority of terrorists are Muslims. It is a lethal form of blindness not to recognize that plain fact.